Our barn dance & ceilidh band have been performing regularly at fundraising barn dances, wedding anniversaries, receptions and private parties throughout the south of England for over 20 years now. Thousands of people have danced to the band over the years! 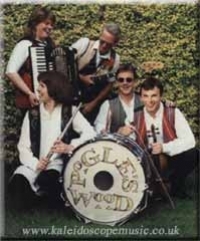 For organised called dancing, the band mainly play English, Ceilidh, Scottish and traditional music, with some American and Irish repertoire added for variety. At many events, ‘sing-a-long’ music to entertain guests whilst relaxing between dance sets is also often requested. With so many receptions taking place in restored and converted barns these days, our barn dance band will provide the ideal ambiance for such a setting. Our popular converted barn venues include: Tithe Barn & Manor Barn in Petersfield, Upwaltham Barns in Petworth, Clock Barn in Whitchurch and Rivervale Barn in Yateley. Other styles of venue within Hampshire, Surrey, Dorset and Sussex include HMS Warrior, Rhinefield House, Chewton Glen, Goodwood House, Farnham Castle, Arundel Castle and Careys Manor.